The statements relating to the Periodic Operating Point analysis can be all classified as control statements of the type defined in Chapter 6. An analysis statement to invoke the POP analysis and three option statements are associated with the Periodic Operating Point analysis. .POP is the four-character keyword ".POP". TRIG_GATE= is the ten-character keyword "TRIG_GATE=". gate_name is the device name of a defined logic gate. This device is considered the triggering gate of the POP analysis. Together with the parameter value of TRIG_COND, it determines the condition that constitutes the start of a new switching cycle in the POP analysis. TRIG_COND= is the ten-character keyword "TRIG_COND=". 0_TO_1 is the six-character keyword "0_TO_1". 1_TO_0 is the six-character keyword "1_TO_0". MAX_PERIOD= is the eleven-character keyword "MAX_PERIOD=". max_period is a positive floating-point number assigned to the parameter MAX_PERIOD. tran_after_pop_fail = 0: Display error message then abort. tran_after_pop_fail = -1: Start a transient analysis with a run time equal to 100 x max_period (see above). tran_after_pop_fail = t, ???MATH???t>0???MATH??? : Start a transient analysis with a run time equal to t.
See Behaviour of POP Analysis after POP Convergence Failure for more details of this feature. The .POP statement must be the first analysis statement among all types of analyses statements specified in an input file. Upon reading the .POP statement, SIMPLIS performs a Periodic Operating Point analysis of the system. If the Periodic Operating Point analysis is successful, SIMPLIS will perform the next analysis specified in the input file. If the Periodic Operating Point analysis is not successful, SIMPLIS will print out an error message and exit. The first .POP statement defines the start of a switching cycle as the time instant when the output of the logic gate named !D1 switches from logic 0 to logic 1. The second .POP statement defines the triggering gate as the logic gate named !D1 in the subcircuit referred to as X1 in the main circuit, and it defines the start of a switching cycle as the instant when the output of the triggering gate switches from logic 1 to logic 0. The two .POP statements above are shown here for illustration purposes. Only one .POP statement can appear in a SIMPLIS input file. The second .POP statement also demonstrates that the triggering gate is not restricted to the logic gates defined in the main circuit. It can be any logic gate defined in the input file. 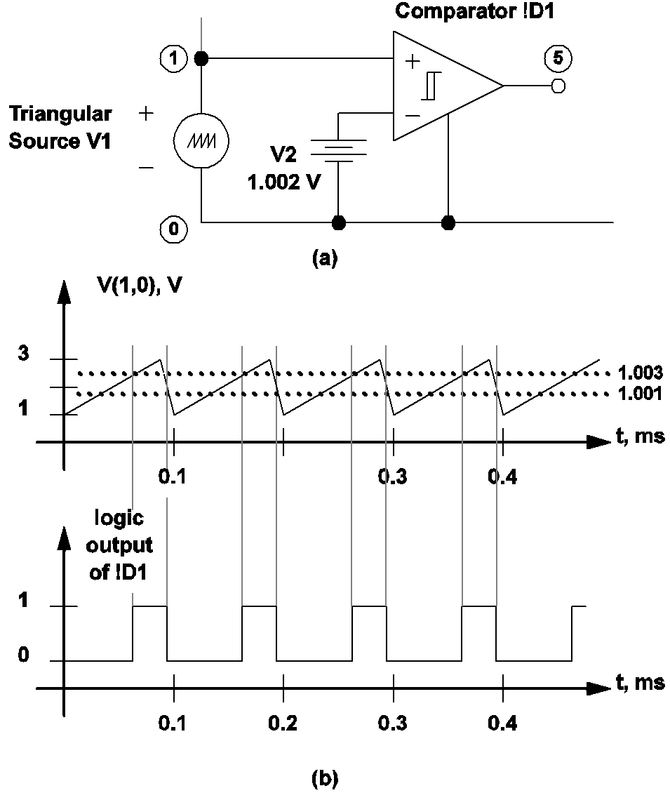 The model statement states that the output of the comparator is equal to logic 1 whenever the voltage at the non-inverting input is 1 mV above that of the inverting input, and that the output is equal to logic 0 whenever the voltage at the non-inverting input is 1 mv below that of the inverting input. Since the voltage at the inverting input of !D1 is a DC voltage source of 1.002 V, this implies that the output of !D1 is equal to logic 1 when the voltage of V1 exceeds 1.003 V, and it is equal to logic 0 when the voltage of V1 drops below 1.001 V. When the voltage of V1 is between 1.001 V and 1.003 V, the output state of !D1 remains unchanged. The diagram in fig 10.1(b) illustrates the relationship between the output state of !D1 and the voltage of source V1. The figure shows that the output of !D1 will have a logic 1 to logic 0 transition whenever the voltage of V1 is decreasing and equal to 1.001 V.
If there are multiple periodic sources driving the system, the periodic operating point analysis tool can be applied only if these sources are commensurate in their periods. In this case, the switching cycle should be defined with a period equal to the least common multiple of the periods of all periodic sources. 10.1 (a) A periodic triangular source, a battery, and a comparator used to define the start of a switching cycle, and (b) Output of the comparator in relationship to the differential voltage V(1,0). With these input statements, the output of the logic gate !D2 is equal to logic 1 and logic 0, respectively, when the output of U1 is above 11 V and below 1 V. When the output of U1 is between 1 V and 11 V, the output state of !D2 remains unchanged. Fig 10.2 (b) illustrates the relationship between the output state of U1 and the output state of !D2. From this figure, it can be deduced that the start of a switching cycle is now recognized to occur when the output of U1 is rising and equal to 11 V. The output of U1 as shown in Fig 10.2 (b) has finite-time transitions when it switches between 0 V and 12 V. If U1 is a SIMPLIS logic gate, we can use U1 instead of an additional logic gate as the triggering gate for the POP analysis. 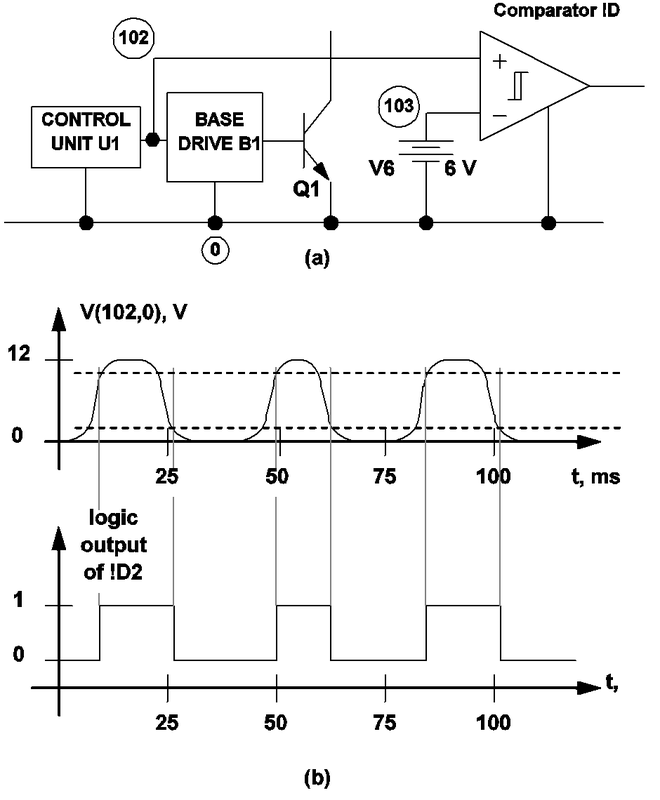 10.2 (a) A sample circuit used to define the start of a switching cycle for a variable-frequency switching system, and (b) Output of the comparator !D2 in relationship to the waveform of the voltage V(102,0). instructs SIMPLIS to carry out each of these transient analyses for a maximum duration of 500 microseconds. If the simulation time of a POP transient analysis reaches 500 microseconds without triggering the start of a new switching cycle, SIMPLIS will print out an error message and exit. For a driven system, the maximum period should be set to at least three times the expected period. For a self-oscillating system, the maximum period should be set to about 10 times the longest period expected. There are several reasons that SIMPLIS may fail to find a triggering condition for the system under study within the set maximum period. One is an error in the definition of the triggering condition. Given correctly defined triggering conditions, it is also possible that the transients resulting from the initial conditions specified for the system would prevent the system from reaching the triggering condition within the set maximum period. Usually, a regular time-domain transient analysis would reveal the reasons that the system failed to trigger the start of a new switching cycle. Abort the run and output an error message. The error is written to a file but will also be displayed in the command shell message box. This action is taken if the .POP parameter TD_RUN_AFTER_POP_FAILS is set to zero. Start a time-domain (transient) analysis. The initial conditions for this time-domain analysis will be exactly the same as the initial conditions used for the POP run and will continue for a period controlled by the TD_RUN_AFTER_POP_FAILS parameter on the .POP line. See .POP Statement for POP Analysis for details. If a normal time-domain analysis had been specified to proceed after POP (for example, because a load transient study was being performed), then this time-domain analysis will proceed normally as if the POP analysis had converged successfully. This mode of operation makes it possible to study the load or line transient behaviour of systems for which POP convergence is difficult. Examples are systems running at very light load whereby they enter a pulse frequency mode of operation. Such systems do not have a well-defined steady state which makes POP convergence almost impossible. But by running a long enough time domain analysis before applying load or line stimuli, a near-steady-state condition may be reached. If no time-domain analysis had been specified after the POP analysis, the data generated during the additional time-domain analysis will be saved so that a diagnosis of the causes of POP convergence failure may be performed. where opt1, opt2, and ..., are various options recognized by SIMPLIS. The five options associated with the periodic operating point analysis and their meanings are listed below. POP_SHOWDATA Shows the progress of the periodic operating point analysis. The default is not to show the progress. In general, this option is turned on as a debugging aid if a POP analysis fails. POP_ITRMAX=n Sets the maximum number of iterations for the periodic operating point analysis. "POP_ITRMAX=" is the eleven-character keyword "POP_ITRMAX=". n is a positive integer between 1 and 100. The default value for n is 20. POP_CONVERGENCE=value Sets the convergence criteria for the periodic operating point analysis. The convergence criteria is satisfied when the relative change in each state variable, between the start and end of a switching cycle, is less than this parameter. "POP_CONVERGENCE=" is the eleven-character keyword "POP_CONVERGENCE=". value is a positive floating point number between 1.0e-06 and 1.0e-14, inclusive. The default value for n is 1.0e-14. Note: During the POP analysis, the maximum relative change in the state variables is reported in percentages, while the POP_CONVERGENCE parameter is entered in actual value. When the POP_SHOWDATA option is turned on, a print/plot file named "XXXX.t4", where "XXXX" is the name of the input file, is generated during the periodic operating point analysis. The format of this print/plot file is the same as that described for the "TIME-DOMAIN PRINT/PLOT FILE", or the "XXXX.t2" file, in Time-domain Data Output. It contains columns of all print variables versus the time variable. The user is reminded that the print variables are specified through the .PRINT statement as outlined in Control Statements for Printing Variables. The data in this data file can be plotted to reveal the progress of the POP analysis. More will be discussed on this data file in the next section. The POP_ITRMAX option puts a limit on the number of iterations of the periodic operating point analysis that will be carried out by SIMPLIS. When the periodic operating point analysis fails to converge to a steady-state solution after this limit is reached, SIMPLIS prints out an error message and exits.